King Norr of Nibb was not content. He longed to know of the world beyond his tiny, island kingdom. Why travel elsewhere, said his people. What place could possibly be more perfect than Nibb? And that wasn’t the only mystery. What kind of monster lurked in waters along the shore? 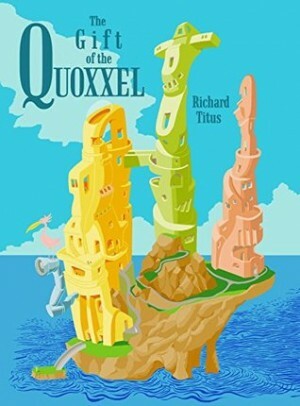 or visit “The Gift of the Quoxxel” on Facebook. When I first started this I thought it was going to be very childish and that I was going to hate it. Though parts seemed suited more for children it didn't bother me. It tuned into the kid in me and made me think about stories I read as a kid. I loved the illustrations, it helped with the story and they were cool, whimsical drawings. The characters were great and so funny. King Norr was my favorite, he was just so slow and naive that it made me laugh. The Queen was great too, they were a great pair because she was the exact opposite of him. Where he was naive she was smart, they played off each other making them a dynamic duo. Yill was great too, though he was a lizard creature, you can't hold that against him. The author did such a fantastic job creating this fun world. I would want to live on this little island, where can I find it? But it would take me awhile to get used to this language. I'm glad there was an interactive glossary for some of the words and phrases because I used that thing like it was going out of style. That was kind of a turn off for me though, it started off being fun because of the weird words but then it got annoying. I had to constantly look up these made up words or uncommon phrases, it was just an unneeded hassle. Keeping up with some of the odd character names was confusing at times. At first I thought them having weird names would make things easier but it didn't. I kept having to remind myself who a character was. I think the humor in this book is enough to win anyone over. It will remind you of your younger days and that's always good, right?